Chloe writes for Wild Abundance’s blog, newsletter, and website. In addition, she cooks for some classes, teaches a few others, and jumps in to help out with management and strategy. These roles give her a welcome outlet for the knowledge and excitement she perpetually cultivates around land-based living and a positive future for the planet. Along with working at Wild Abundance, Chloe magically juggles co-managing a 23 acre homestead and small-scale dairy, parenting, lifelong learning, and maintaining meaningful relationships. She majored in Agroecology and Sustainable Food Systems at UC Santa Cruz. There, she deepened her inborn passion for real food and social justice. 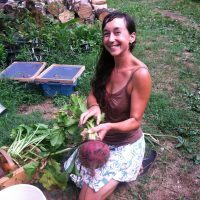 For 10 years before landing at her own homestead in Western North Carolina, she explored many manifestations of “sustainable community” all over the world. In addition to growing and preparing food, she loves cultivating, foraging and utilizing medicinal plants and mushrooms.